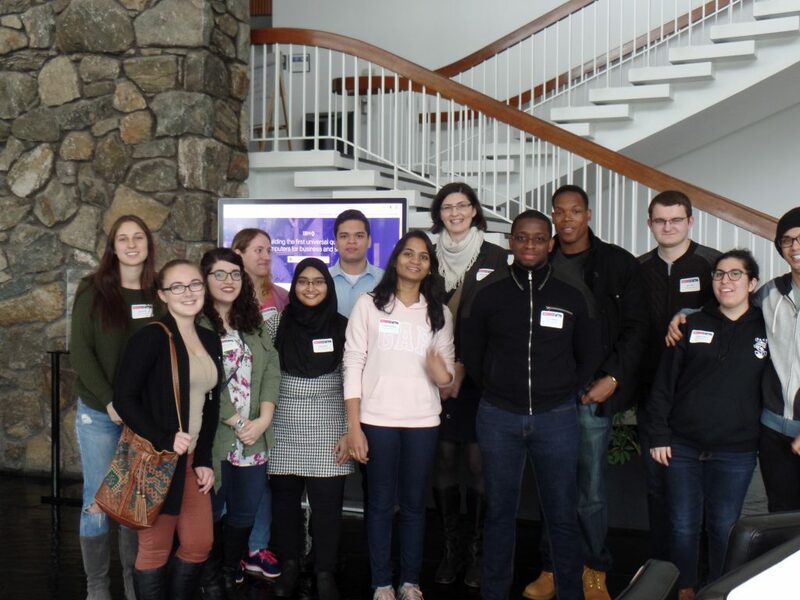 On Friday, April 21, 2017, a group of Seidenberg students and faculty took a trip over to Yorktown Heights, NY, for an exclusive tour of the IBM Thomas J. Watson Research Center, IBM’s chief research facility and home of the ThinkLab. The tour focused on ThinkLab’s main areas of research: artificial intelligence and quantum computing. 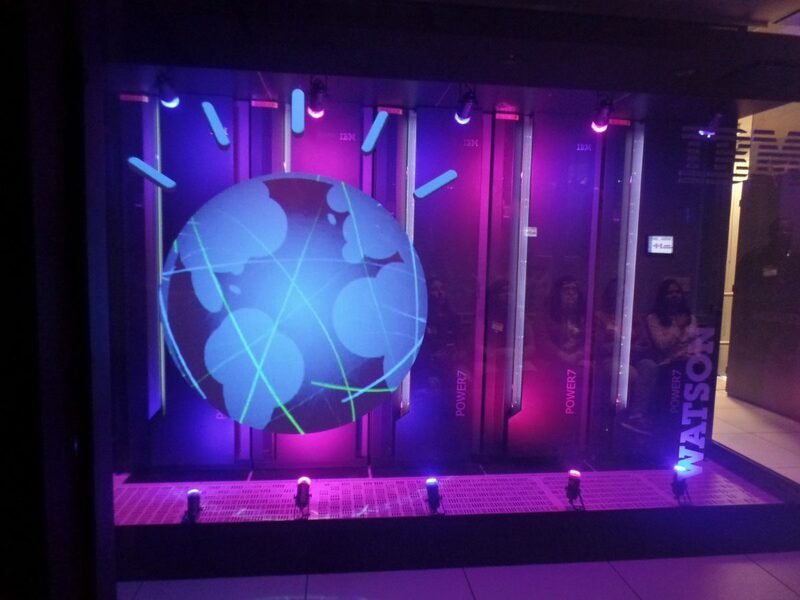 The tour began with the history of the facility, the key problems researchers are currently working on, and an introduction to the Watson computer. To add to the excitement, this presentation was delivered on a multi-screen viewing system guided by a sensor-based wand, which was inspired by the touch-screen interface used by Tom Cruise in the sci-fi film Minority Report. Afterwards, we got a glimpse at the first quantum computer! Quantum computers may sound like technology from a sci-fi movie, but they are very real and ready to tackle complex problems, such as investigating molecular interactions, discovering new drugs and materials, or enhancing data safety by applying the laws of quantum physics. IBM has built the first universal quantum computer and Seidenberg students got the chance learn how it works! 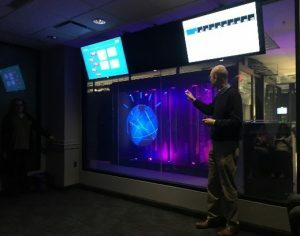 We then learned about how Watson and its artificial intelligence capabilities were developed, including the various ways Watson technology has been applied, from developing treatment plans for oncology patients to creating satiable recipes independently, and even how it was able to beat the two greatest Jeopardy! champs in existence in a televised tournament. This fascinated Computer Science major Jeana Cosenza, who was deeply interested in the functionality of Watson. However, “functional” doesn’t even begin to describe the capabilities of IBM’s artificial intelligence system. In fact, the Watson system could very well change the way we learn, reason, innovate, and even conduct business… which should remind you of something else that will change the world as it continues to expand its ‘cognitive space’ and apply its knowledge to more areas. That ‘thing,’ of course, is a Pace student! 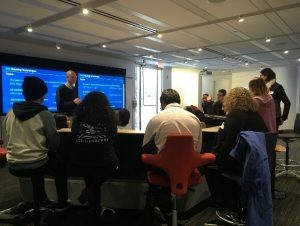 The very purpose of embarking on a trip to the ThinkLab was to introduce students to IBM’s groundbreaking research and, most importantly, to inspire students to be creative problem solvers. In seeing how researchers at the ThinkLab apply technology to solve myriad problems across various domains, students who went on the trip were able to gain a new perspective on the power of technology. Saima Khot, a graduate student in Telecommunications Systems and Networks, said she learned a lot from the trip because she entered this experience knowing nothing about IBM’s research. But even those who were familiar with IBM research, namely Information Technology major Adriana Aluia who will intern with IBM in Austin, TX, this coming summer, were able to take away some knowledge and inspiration. And that’s exactly what Seidenberg’s out-of-classroom experiences are all about, whatever they may be! On behalf of the trips’ co-sponsors, the Seidenberg Tech Collective and Women in Technology @ Pace, and the entire Seidenberg School of CSIS, we would like to extend our biggest thanks to IBM’s Jay Murdoch for giving a fabulous and informational presentation and warm welcome, and to Stephan Barabasi for making our visit possible. Visiting the ThinkLab and viewing all the amazing projects was a fun, educational, and inspiring experience for all. Thanks to Kaitlyn Houlihan for this fantastic piece!